Each of our three group classes will be held once a week and there will be six sessions over a six week period. Every class will start at 5 PM and last an hour. All courses require a one time payment of $168.00. Classes will be held at Dog Holliday’s Pet Resort unless instructed otherwise by our trainer. Just like children, it’s important to start teaching your pup well at a young age. This course is designed to build focus, teach the puppy it’s name, establish your bond, and learn the five basic commands – sit, stay, down, heel, and come. This is all done while keeping in mind the puppies short attention span. In these classes, our trainer will focus on replacing unwanted behaviors with desired behaviors and replace destructive habits with positive outlets. We’ll use techniques like set-up, extinction, and the correctional sequence. Some topics we may cover will be getting into the trash, jumping on people, submissive urination, seperation anxiety, or socialization. In a group setting, we will cover commands like sit, stay, heel, down, and come. Also, topics like building focus, teaching the dog it’s name, verbal markers, effective communication, staying consistent and persistent at home, and solidifying your bond. 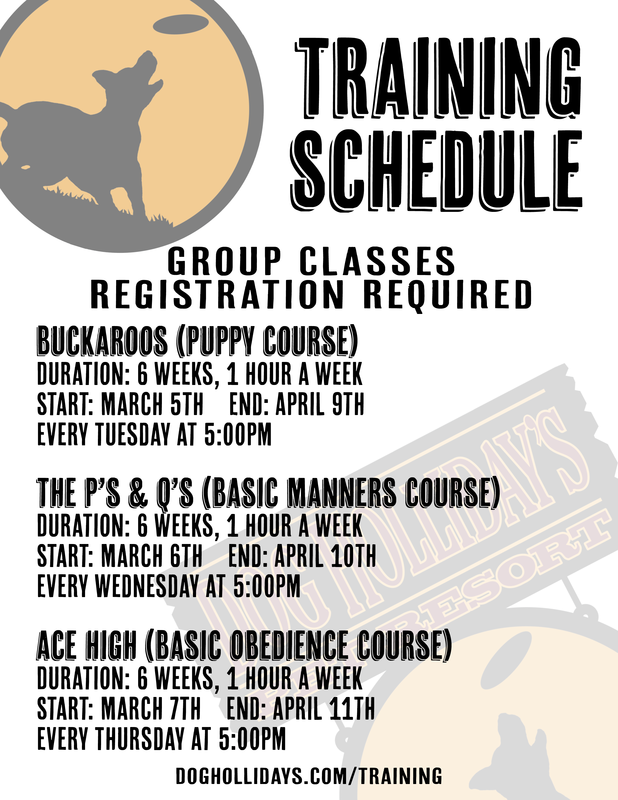 This course is designed for dogs who are already on good behavior. Work one-on-one with our trainer and your dog. Cater each session to your specific wants and needs. This is a great option for dogs that don’t get along with others – a bandit or outlaw, if you will! All private lessons are by appointment only. Transform your hellish hound to a classy canine while you’re away. Our trainer will record a short video of his teachings so you can keep up with the training at home. This is a great option for pet owners who love to multitask! Board & Train is also available to daycare dogs. These classes will be a one-time, group session. Topics will change weekly. This is a perfect option for dogs who are great but could use a little work on one issue or habit.